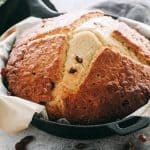 Soda Bread Recipe in a Skillet – Super easy, slightly sweet, quick and traditional Irish Soda Bread made with just 6 ingredients! 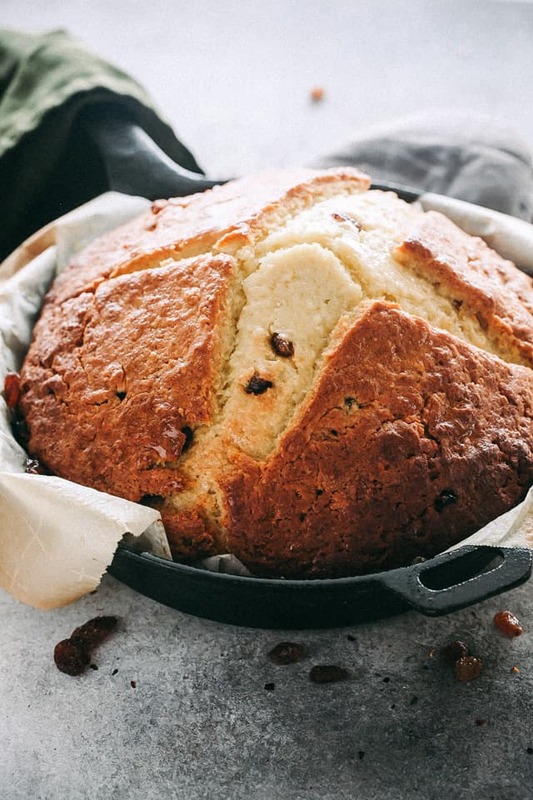 This easy Skillet Soda Bread is a quick bread recipe made with raisins, and it will take you about 5 minutes to prepare it. Just stir together the ingredients, transfer the dough to a cast iron skillet, and GO! This bread is for the bread lover and not necessarily for the bread-maker, which is perfect because, there’s no kneading, no time waiting around to rise, no not much of anything. Just a stir, a bit of shaping, and done. 5 minutes of work for a fresh loaf! GIMME! Irish Week continues, aaaaaand for the next 2 days, my name is Katherine McPetrovska. I like Green Beer, Irish Martinis, and Bailey’s Buttercream Brownies to wash it all down. ☘☘☘Nice to meet you! Heeey, shams! How goes the battle? <<< Irish slang for “how are you”, and it makes sense! Battle = life! It’s pretty awesome, I’d say! Especially when there’s soda bread to be celebrated. Any excuse to snack on bread, know whadda mean? 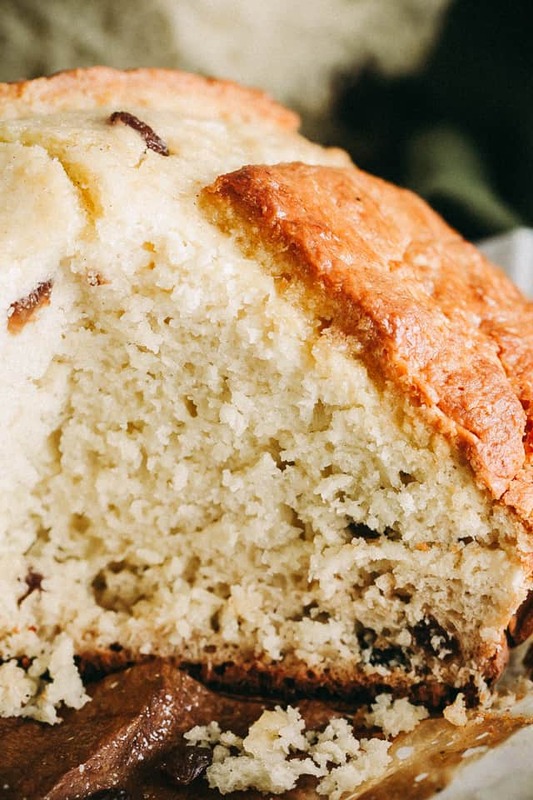 There is just something so… comforting… about homemade bread. Right? I have had this particular recipe on the blog for years, but I had to reintroduce it to ya again for the reason that everyone needs a simple go-to recipe for bread, and not just because it’s St. Patrick’s Day. I mean, it helps, but it doesn’t have to be made only for the Holiday. Place dry ingredients – flour, sugar, baking soda, salt – in a mixing bowl and just whisk it all together until thoroughly combined. Whisk wet ingredients – buttermilk and eggs – until combined and stir into the dry ingredients. Continue to stir until just everything is well incorporated. 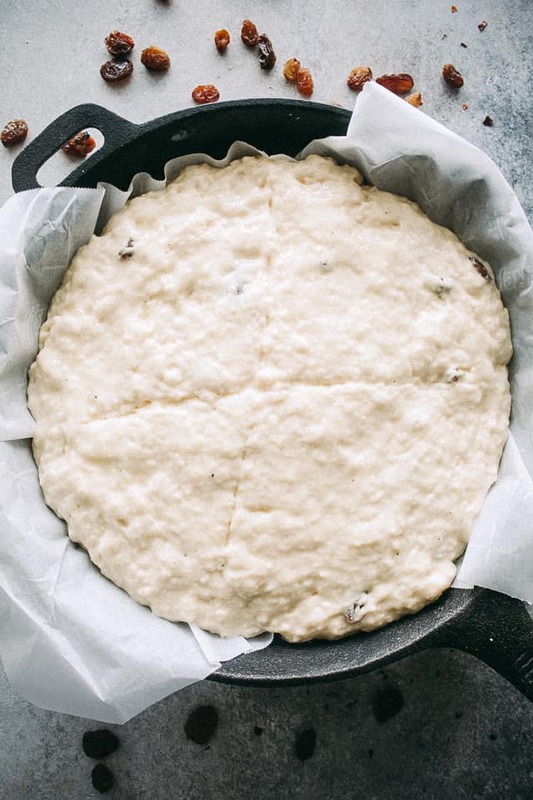 Add some raisins and transfer dough to a parchment lined cast iron skillet. Bake for 50 minutes, or until top is golden and a toothpick inserted in the center comes out clean. Also, sidenote: can I get a round of applause for providing a recipe today without chicken in a pan?! WHAT IS GOING ON. That’s another reason I’m a soda bread fan. No chopping, no sauteeing, and I still crave it. It’s like, bread has magic powers, and I believe they’re called carbs. Also?!? 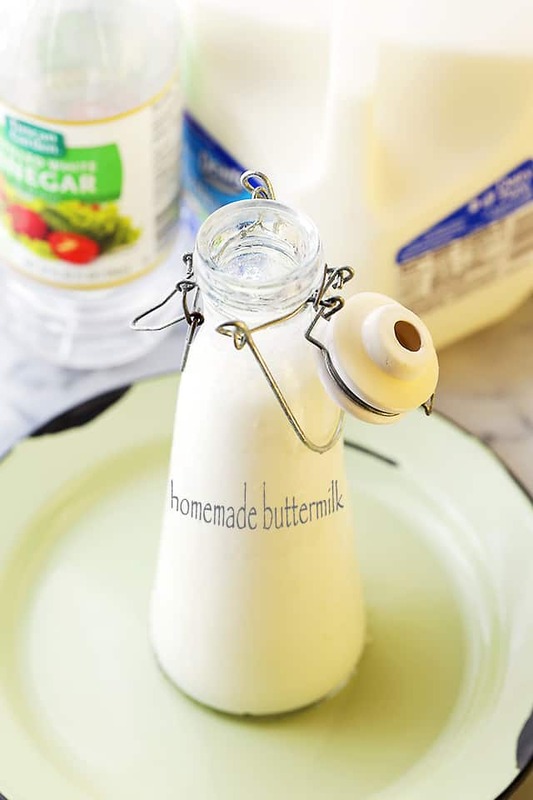 I made you some homemade buttermilk to use IN it! Yeah, completely homemade. Like, you take milk and vinegar, stir it all together and BAM! That’s how homemade buttermilk is done. Now, if I only had a cow in my backyard, then it’d be completely homemade. I wanted to mention that I added raisins to this, but you really don’t have to. According to some articles I read, the raisins are the “Americanized” version of the bread so to make it sweeter. For when I want to snack on it, I add raisins, but when it’s to be paired up with warm soup or a Dublin Coddle, I ditch the raisins and go straight-up authentic. It’s SO worth it! If you’re looking for something simple, but fun to make in the kitchen for tomorrow’s Holiday, this should be IT. It’s easy, quick, very simple, but the results are dawg gone good! Git ‘er done! 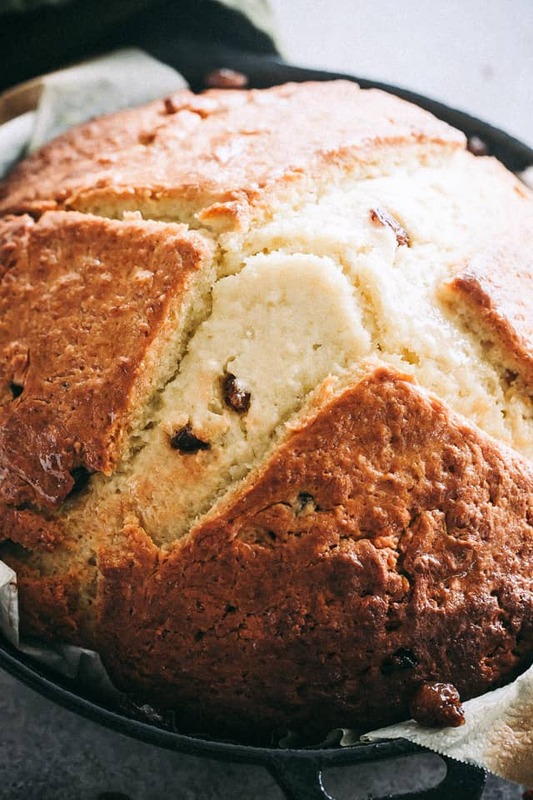 Super easy, quick and traditional Irish Soda Bread made with just 6 ingredients! 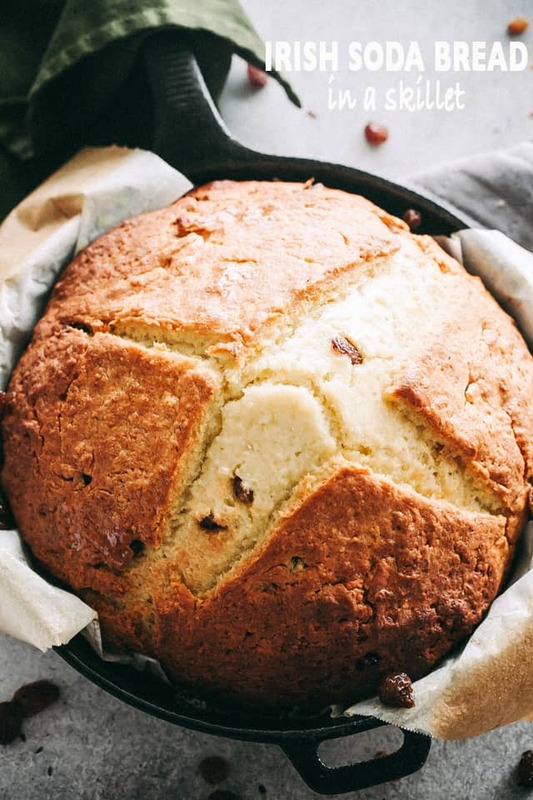 Line a 10-inch cast iron skillet with parchment paper and set aside. 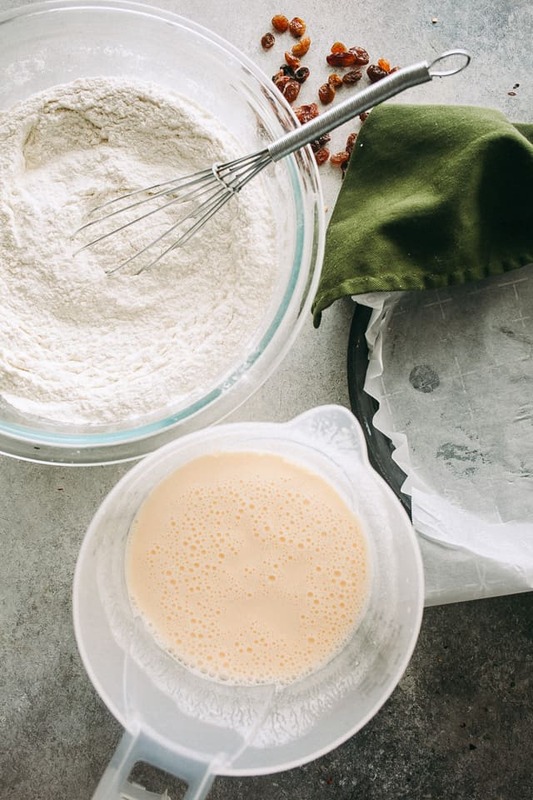 Combine flour, sugar, baking soda, and salt in a large mixing bowl; whisk until thoroughly combined. Make a well in the center of the flour mixture and pour in the buttermilk mixture; stir with a wooden spoon just until combined. DO NOT overmix. Transfer prepared dough to lined skillet. Score a cross in the top of the dough before baking. Bake for 50 to 60 minutes, or until golden brown and a toothpick inserted in the center comes out clean. 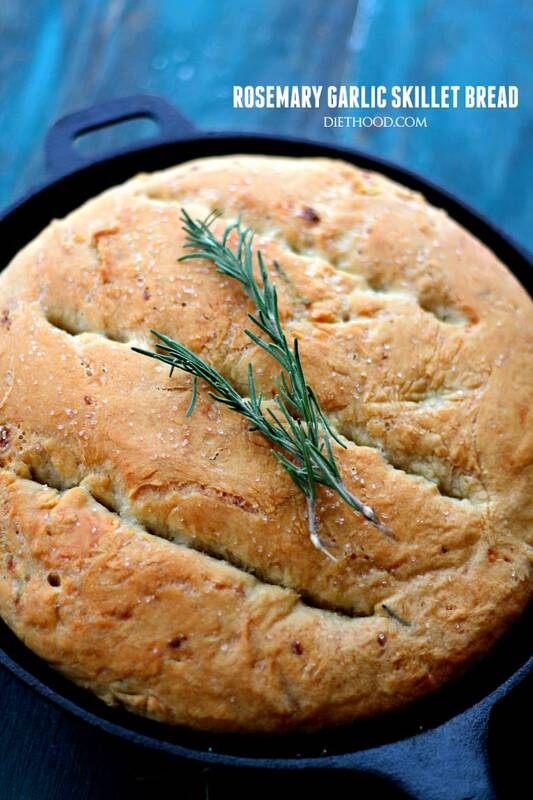 Remove from oven; let bread sit in skillet for 5 minutes. Remove to a rack to cool briefly. Extremely easy. Love recipes like this. However, it is too sweet for me even without thr raisins. If I cut the sugar to 1/3 cup, will it ruin the chemistry? Can you add caraway seeds?? 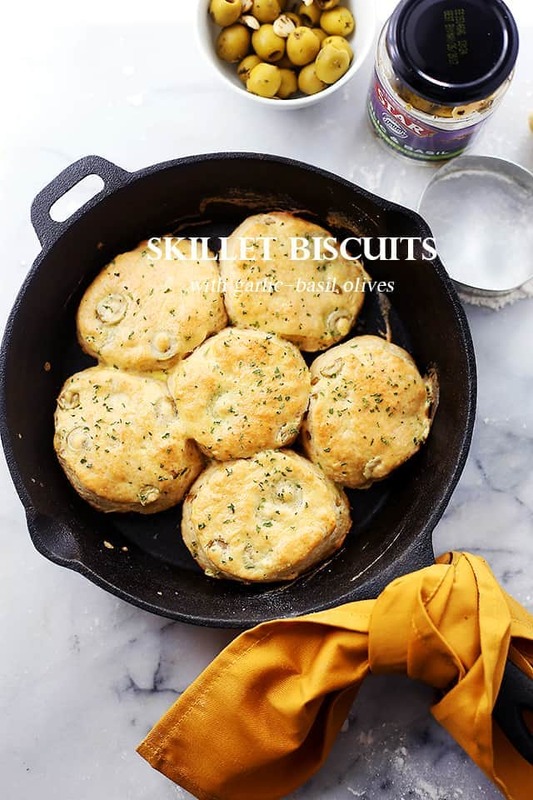 Does it have to be cooked in a skillet, or can another type of pan be used? Hi! 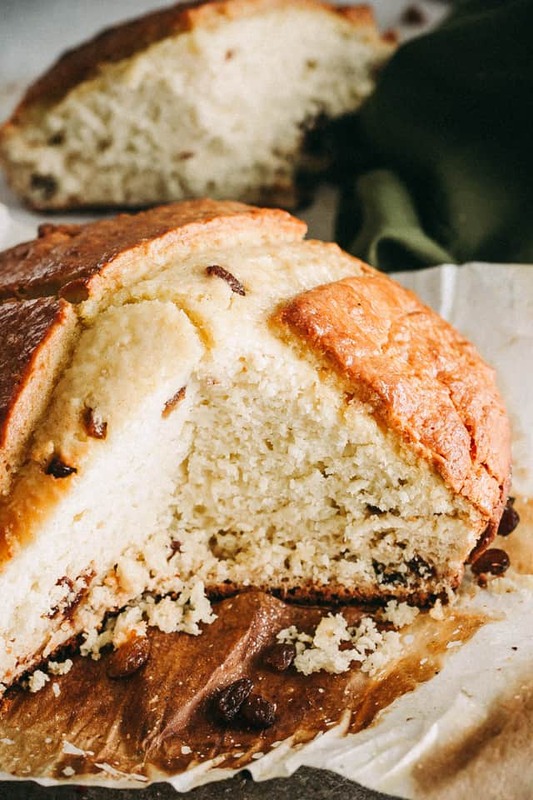 Yes, you can definitely use something else, like, a loaf pan or a cake pan. I’ve never made soda bread before but I love to eat it. This looks like the perfect recipe to try out! What a nice tasty bread for St. Patrick’s Day! Looks yummy! Cant wait to try this! Alright, you’ve convinced me I need to try making soda bread. Looks wonderful and so easy too! 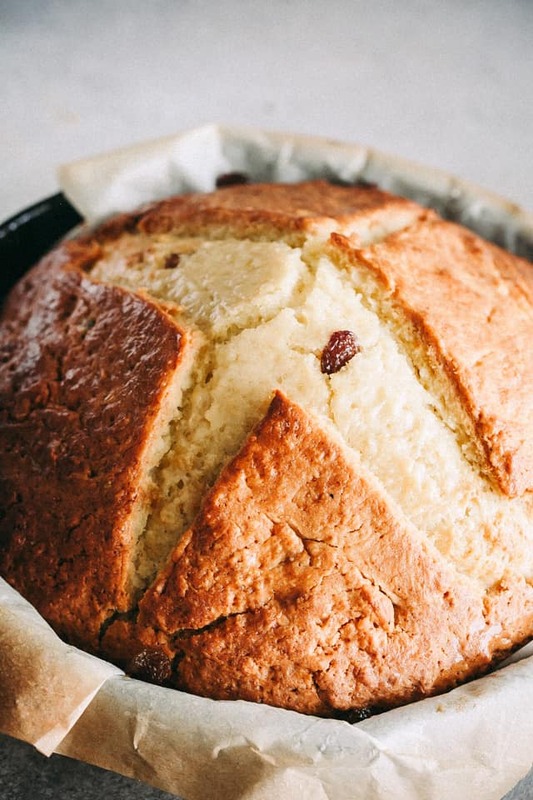 I have never made homemade Irish soda bread before, but this looks SO easy to make! 🙂 I am going to have to give it a try soon for sure. Bread making is always something people don’t do because it takes so long! I love this one doesn’t take long to make! I’ve never tried soda bread before.